Looking for a quick main dish? 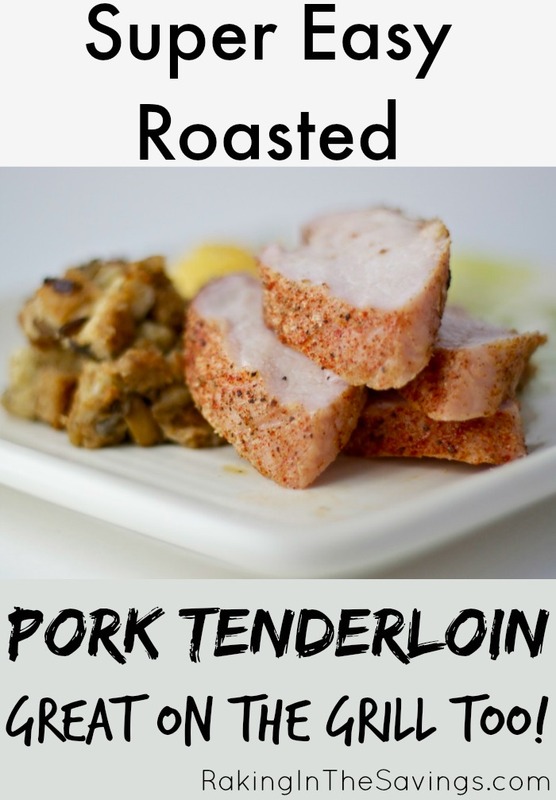 Try my super easy Roasted Pork Tenderloin! It only takes about 35-40 minutes from start to table and everyone is sure to love it! Pork Tenderloin is a delicious and easy meat to prepare. You can try all kinds of seasoning combos and marinades. We’ve played around with so many different combinations and never found one we didn’t like! It can be a bit expensive, so watch for it to go on sale and throw a few in the freezer! To start, preheat your oven to 325°F and get your seasoning mix ready. 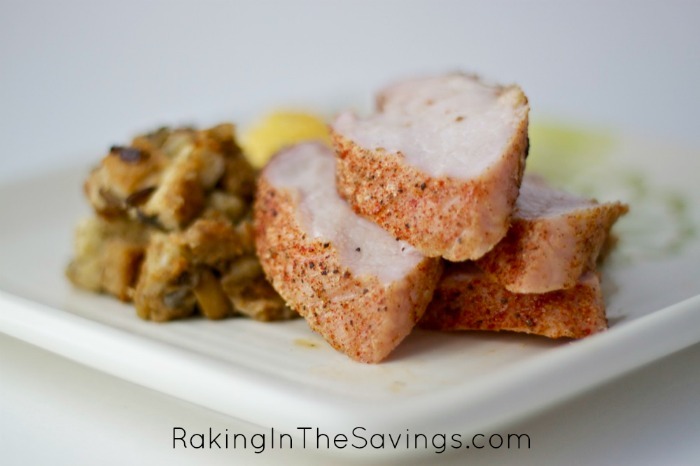 One of our favorite seasoning recipes for pork is below. Rinse your tenderloin and remove the silverskin. This is a thick fat that doesn’t soften when cooked and is extremely hard to chew. Coat the tenderloin in the rub. Put the tenderloin on an oven safe baking rack in a baking sheet. If you don’t have a rack, you can just put it in a shallow baking dish. Cook for about 20-30 minutes, until a meat thermometer reads 145°F. Let rest for at least 3 minutes before slicing on a bias (diagonally). If 145°F makes you do double-take, it’s okay! The FDA changed their recommendation for pork a couple years ago. The lower temp results in a juicier meat and won’t hurt you! You can also throw it on the grill for a slightly different flavor. During the warmer months, we prefer to grill it to help keep the house cooler without the oven heating up the air. Mix together all seasoning and spices for the spice rub mixture and set aside. 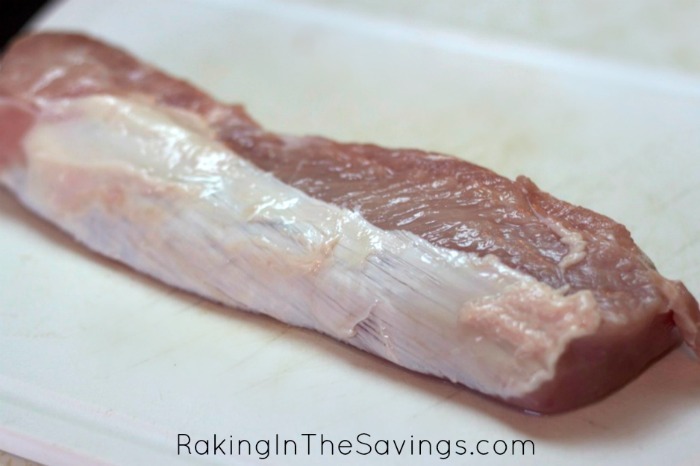 Rinse pork tenderloin, pat dry, and remove silverskin. Coat with the spice rub well, and place on a baking rack over a baking pan. Bake at 325 for 25-30 minutes, or until the internal temperature is at 145 with a thermometer. Remove from oven and let rest for 3-5 minutes. Slice on a bias and serve immediately. This looks really yummy & super easy. I will have to try it! Nice and easy. Thank you and have a great day! 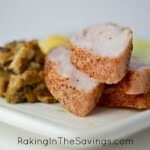 I love pork tenderloin, it’s cheap and easy. Thanks for posting. Hello from Treasure Box Tuesday. Previous article: Faded Glory Girls Tank Tops Just $2! Next article: Daily Coupon Roundup-Did You Miss Any of These New Coupons That Came out Today?